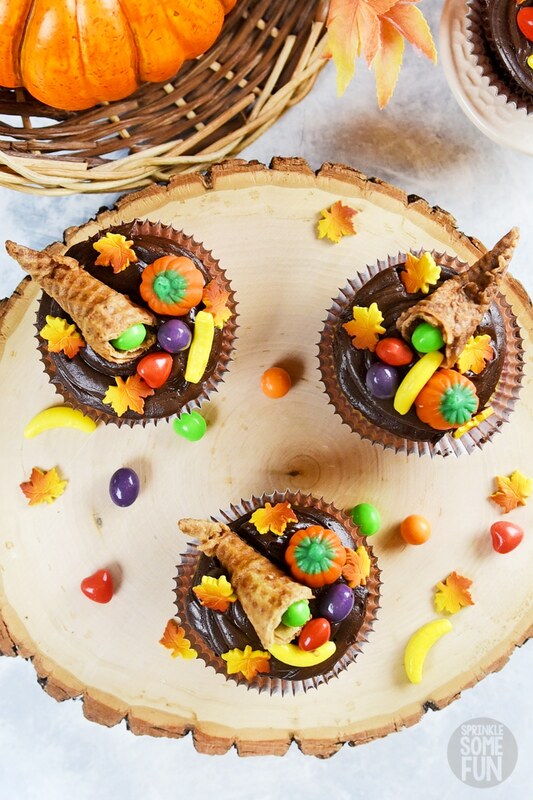 Thanksgiving Cupcakes with Cornucopia Toppers are an adorable way to dress up cupcakes for Thanksgiving! These make the perfect centerpiece for a Thanksgiving dessert table. Also, they are easy enough that the kids can help decorate them too. I just love Thanksgiving. Over the years I think I’ve come to appreciate Thanksgiving more and more. Thanksgiving isn’t pretentious; no long lists of presents to buy or want. It’s just family/friends gathering together around our favorite Thanksgiving foods and thanking God for the blessings. I am looking forward to our Thanksgiving celebrations this year for sure! In our family the desserts get their own table, and I think these cupcakes should be the centerpiece this year. 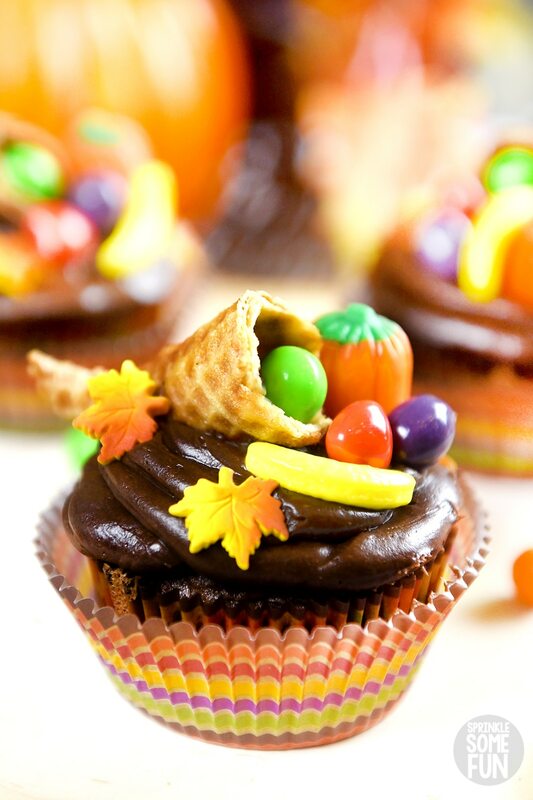 These cute Thanksgiving Cupcakes will be a big hit with the kids and adults alike. Have you ever wondered what a cornucopia is or why it has such a weird name? I found out that it might date back to ancient mythology and it is a symbol of abundance. That’s why it’s also called a Horn of Plenty. In North America, we associate the cornucopia with Thanksgiving and the abundance of the harvest. I never really knew much about the history of the cornucopia before I was an adult. Cornucopias do make a beautiful Thanksgiving centerpiece and an interesting segue into the history of Thanksgiving. 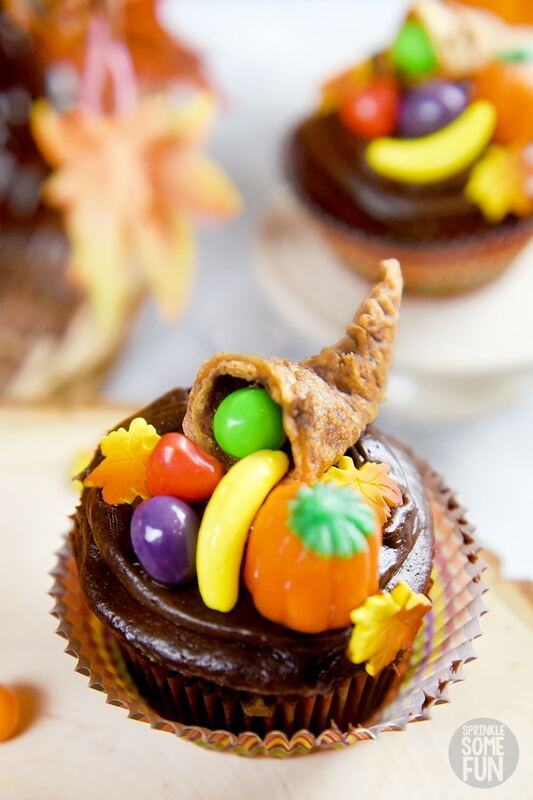 That’s why I think these cornucopia cupcakes would be great for any Thanksgiving celebration. These would also be great as a little school lesson too for the kiddos. 1-2 Boxes of sugar cones (usually come in 12 cones per box) I suggest only using sugar cones for these and not waffle cones. 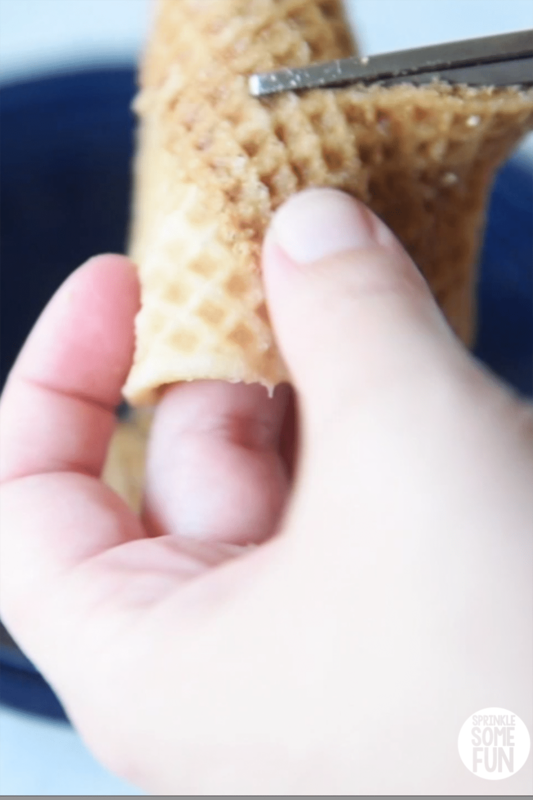 The waffle cones have a bigger size and will not work to make tiny cornucopias. Baked and frosted cupcakes (I suggest 12-24). 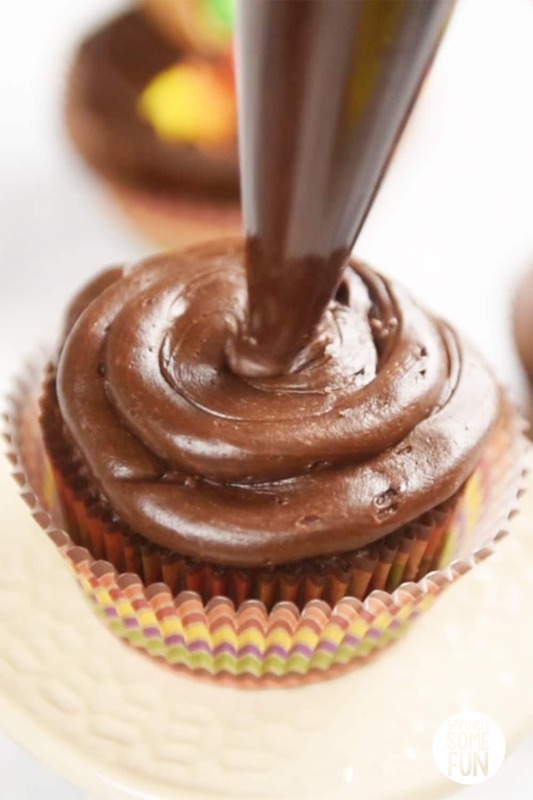 I used chocolate cupcakes with chocolate frosting for these. I liked how the frosting looked with the decorations, but I think they taste great with the chocolate too. A Box of Runts candies. You can usually find these at Walmart or I’ve been able to find them online too. A box Wilton fall leaf sugar decorations (I found these at Walmart last year… you can use sprinkles or omit this if you can’t find the leaves). Walmart always sells a variety of fall themed sugar decorations (at my store) and so I hope they will have these leaves again. They are so pretty! First, the sugar cones were dipped in water and heated to make them soft so I could cut and shape them into tiny cornucopias. 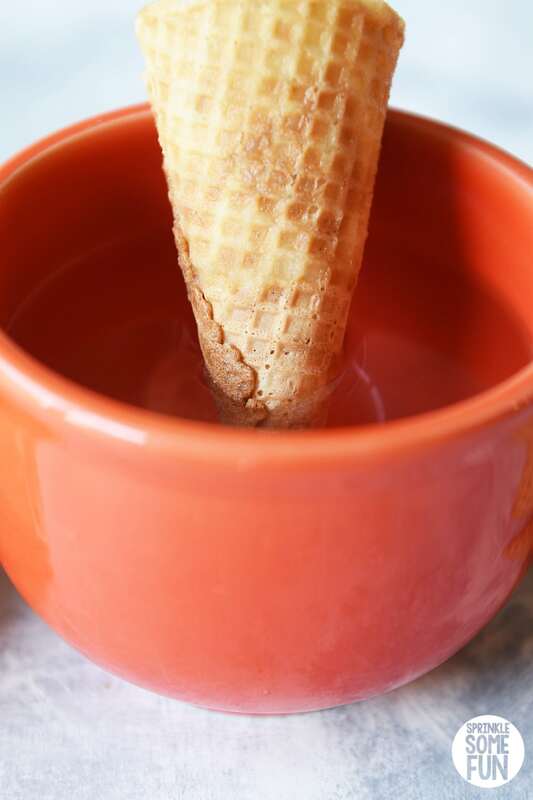 I made sure that the whole cone had been submerged before heating them. Softening allows you to cut off the sugar cones at just right place for the size you want your cornucopias. 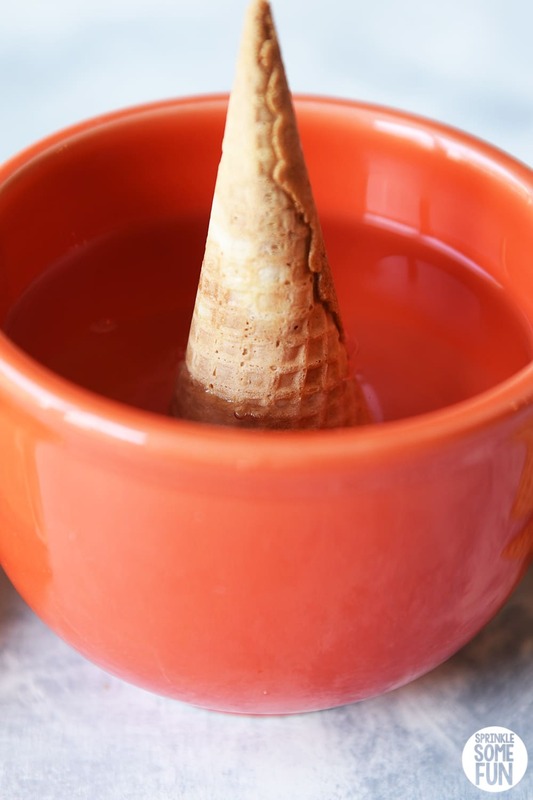 To soften you will place the cones in very hot water (both sides) for around 15 seconds. 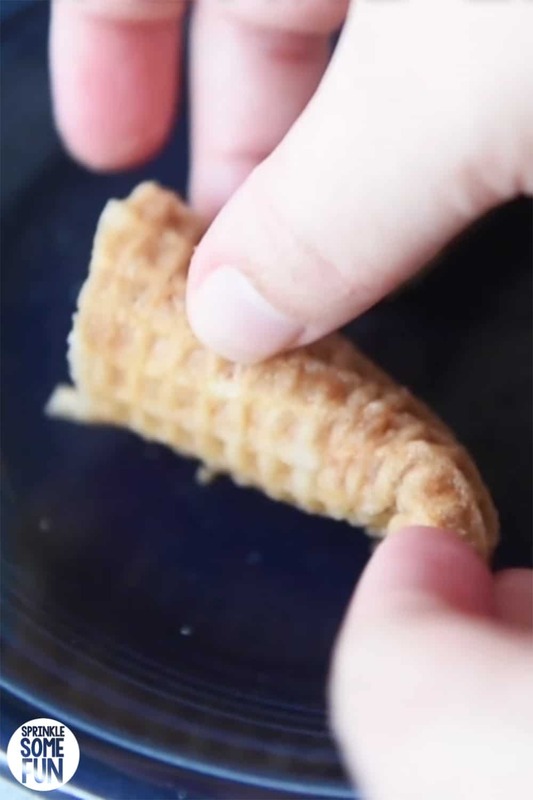 Next, microwave for just 10 seconds or until the cones have softened enough to shape. If after 10 seconds they do not shape easily then put them in for another 10 seconds and so on until they are softened. You may also need to submerge them again if they are not soft after the second round in the microwave. This step involves a little trial and error. Before they dry out you’ll need to cut them and shape them into a cornucopia shape. I made each one around 2 1/4 to 2 1/2 inches in length which was the perfect size for the cupcakes. You don’t have to be perfectly exact with the measurements, but just try to think of how big a cupcake is and eyeball it. To dry the cornucopias without them losing their shape you will want to hold them in place with something. I was able to hold the shape with the outer ring from a mason jar lid. 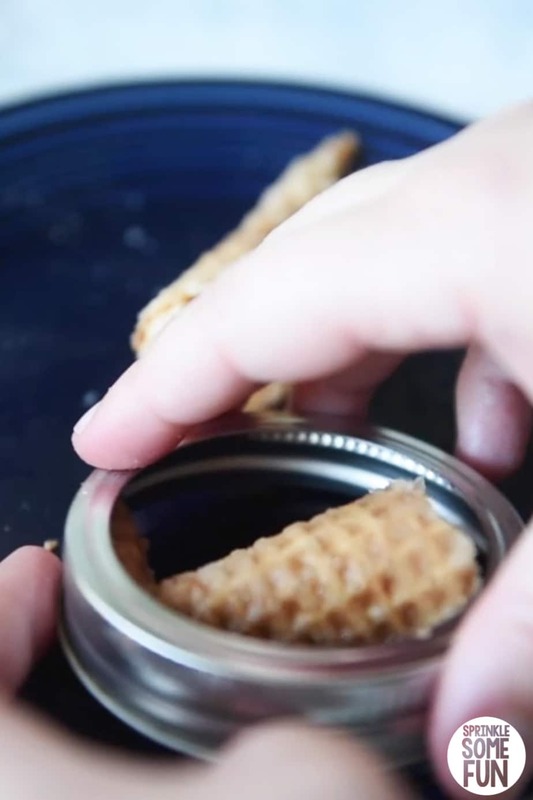 You can use the edge of a bowl to hold it in place too, but I really liked the mason jar lid for this. The next step is to let the cornucopias dry out for at least an hour (it may take longer so make this part ahead of time). It took mine quite a while to dry out completely because I submerged mine a little too long in the water. You could decorate with them a little sooner, but my suggestion is to let them dry completely or at least until they hold their shape. 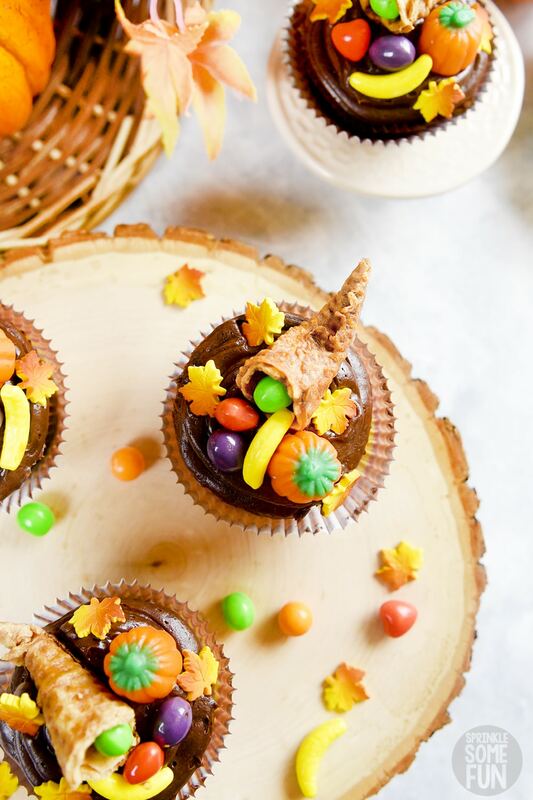 Lastly, ice your cupcakes (I like the chocolate for both taste and color) and then use your fancy cornucopia toppers to decorate with. I think the Runts, Mellowcreme pumpkins and leaves were perfect for this. The cornucopias were able to hold around 1-2 runts each which ended up being perfect amount. The rest of the Runts I placed on the outside of the “Horn of Plenty” like it was overflowing. Then the leaves were put on as a final touch to bring it all together. The sugar cones ended up looking perfect as cornucopia toppers for Thanksgiving cupcakes! I know that everyone will be thinking PIE at Thanksgiving, but don’t you think these deserve a place at the dessert table this year? It’s always nice to change things up from time to time. Plus, there is always room for just ONE MORE DESSERT at Thanksgiving. Don’t you think? It’s not over until our pants send us the signal that we are done! What Thanksgiving desserts will you be making this year? Share them below! Connect with Sprinkle Some Fun! If you LOVE these cupcakes, be sure to stop on over in my Pinterest Community to share a picture of YOUR cupcakes! 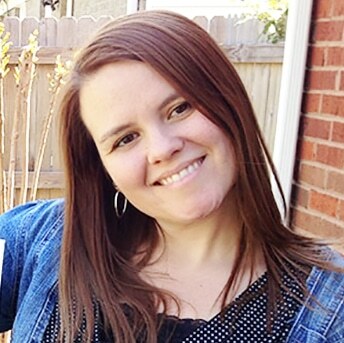 Or share it on Instagram and tag me #sprinklesomefun so I can see it!